Here is a mess that I made. I am ashamed of this too. Last year we used the tractor on this road through the woods, when gathering sap. This year, because of the bad condition of the road, we were forced to use the tractor again. The sled bottomed out. 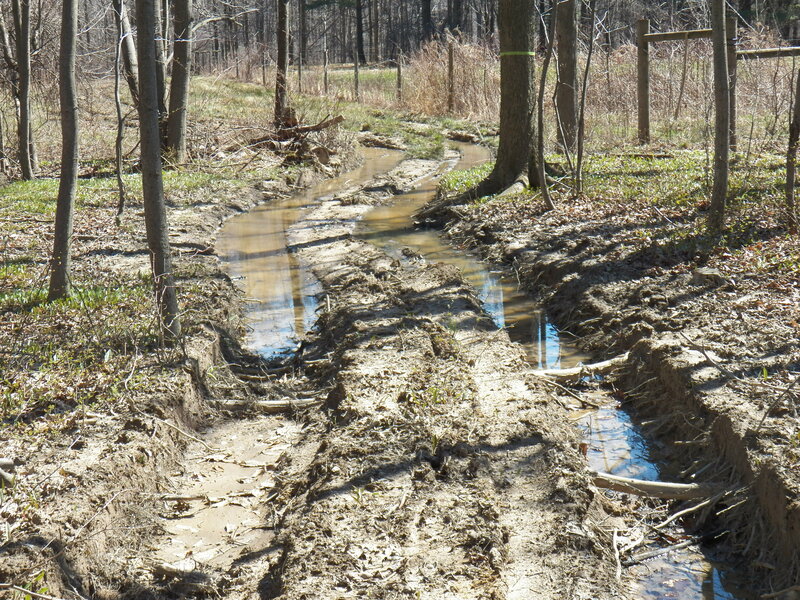 The footing was terrible for the horses, rendering the road unusable, for anything but the tractor. I have sorted out how to repair the road. We will drain the water and give it a place to go. A small dozer will then smooth the ruts back out. Lastly, I will banish the tractor from the woodlot unless conditions can support using it. Horses make very little impact on the land and forest, this is not the case for tractors. The whole problem started due to having knee surgery. I figured, “what can one season of tractor use hurt?” Well, now I know. The wet year made it impossible to fix the road last year, so the problem was made even worse by continued use. I will be very glad to have this mess repaired and the problem behind me. I am working extra shifts at work due to a vacancy. The extra shifts along with a wet spring are making me tense. I am just now, in the last two days, getting into the fields. Like all area farmers, I am in a race to get crops planted. The haymaking season is upon us too. I struggled with my feelings yesterday. I drove to work, while my mind and soul continued to work on the farm…. I felt as if I was in a rut. It will all work out. I am giving up a little sleep, pushing myself a little harder. The planting season is short, so once I get it done, the celebration will help me soar above today’s ” down in the dumps” feelings. I will say, my hours working on the farm, help me to cope with the extra shifts and frustrations that come along with it. It’s so true that the payoff we can get from working with the earth gives such a true, to-the-heart reward for hard work. It can be so frustrating to go to the “official” job every day and feel like nothing really every changes. Then, you work at your “unofficial” job and see life and growth and blessing from the work you put into it. Nature’s compensation plans turns out to be the best, when all is said and done. You are very right Sherri, just a few hours here on the farm, heals my mind, body and soul.